« The early Arsenal. From zero to 10,000 in five years. And so we turn to James Gibb Fotheringham (known as Jim) who was born in Hamilton on 19 December 1933 and died on 23 September 1977 at the very young age of 44. 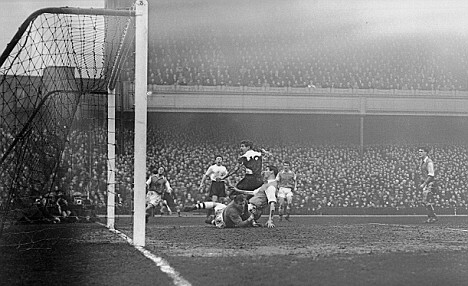 Arsenal was his first club and our first sighting of him was on 4 November 1949 when Jim joined Arsenal as an amateur. When Ray Daniel moved to Sunderland after playing 87 games for Arsenal Bill Dodgin became the first choice number 5 and played 39 games in the 1953/4 season. But he in turn was dropped by Tom Whittaker in favour of Jim Fotheringham and Dodgin only played 3 first team games in 1954/5. Jim made his debut on 6 November 1954 in the game against Bolton playing centre half (as he always did) and is recorded as being 6′ 4″ at the time. Jim played 27 games in that season, and 25 games in 1955/6. However he dropped out of contention after the game on 21 January 1956 against Portsmouth. That we lost 2-5 away suggests perhaps that as the centre of defence he was to blame (Arsenal having won only one of the last six matches) but it may have been an injury as up to that point he had played every game except two. Wiki suggests in a very short article that Jim got injured in February – if so it was in playing for the reserves. Bill Dodgin now came back in and played at number 5 for the rest of the season and kept his place in 1956/7 playing in that position for 41 of the 42 league games. In 1957/8 Jim had two spells in the side – playing the first three games and the last 16 , Bill Dodgin taking the number 5 shirt for all the other games. Dodgin kept his place in 1958/9 as Arsenal changed managers and George Swindin came in. Jim Fotheringham had only one match on 26 December 1958 – it was his last game for Arsenal and as a centre half it wasn’t a good one: Luton 6 Arsenal 3. On 27 March 1959 he joined Heart of Midlothian for £10,000 but did not stay long and indeed didn’t play at all for Hearts. Later in 1959 he moved to Northampton Town. It is reported that a bad injury cut his career short at that point, but I have no further details. The picture shows Jim colliding with keeper Jack Kelsey, in a league game against Tottenham. At Arsenal however Jim Fotheringham did play for the London XI that took part in the first ever Inter Cities Fairs Cup. He was one of the 54 players used across eight matches in three years. If you have any information on Jim Fotheringham that will complete the story of him, please do write in. Hi,Tony I am Jim’s eldest son and was wondering what sort of info on my dad that you were looking for? Ross, many thanks. There is no rule on this site of what we publish – we have all the records of all the matches and the clubs players played for, but I do like to cover other issues – in particular what happened to players after they left football. In writing up the report on your father I mentioned that I had seen a report saying that he had a serious injury at Northampton Town (which co-incidentally is the nearest league club to me, and one that I occasionally go to watch when Arsenal are not at home). I’d like to know if that were true, and then what happened thereafter. I’ve managed to find what many players did after their playing days were over, and how life treated them, and it is very interesting not just for the team running this site, but for many of our readers to know this. Obviously we don’t want to pry – we just like to complete the picture. I can add that some of these stories are then used by Arsenal.com (in agreement with the AISA Arsenal History Society, and where we do find information that is not publisheed elsewhere that adds to the picture I do liaise with them. Please do write to me at Tony.Attwood@aisa.org if you would like to take this further. I really would like to hear from you.